Alan, our family loved Little Lulu. Had a subscription for years. Wholesome, real kids situations, and genuinely funny. Witch Hazel's daughter was named Little Itch. Yes....every home had a bottle of this...a box of Arm & Hammer in the fridge....and a can of paprika that lasted from kindergarten to high school. I still use it right after shaving. Works well. My father used it for an after shave when he ran out of Old Spice. Why was it called that? Does anyone remember Little Lulu comic books? There was always one story in each issue about a witch named Witch Hazel. Witch Hazel has astringent, antiseptic, anti-inflammatory, antimicrobial, antibacterial, antifungal, and anesthetic properties...it's to be used externally...look it up! I'm an herbalist, so you came to the right place! If I had to narrow my healing medicinals down to the top oh, 100...never mind, but for some of us it's vital to know this stuff! 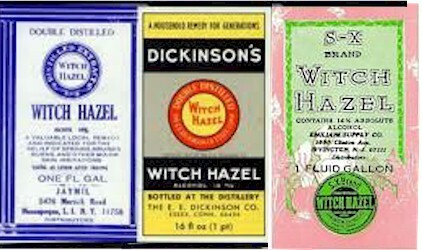 Dickinson's Witch Hazel was a fixture in my family's medicine cabinet, but I don't have a clue as to what it was for, other than acting as some kind of soothant for the skin. We used to use Witch Hazel (the Dickinson's label looks familiar) on mosquito bites and the like, to combat itching. Apparently, it still exists.